BioSwing Secrets: The insider information on the golf learning model that has been described as "the golf swing of the future"
BioSwing Secrets contains my updated information on owning and integrating a simpler and better golf swing. This product has come 10 years after the original BioSwing product was released. I have blended the complicated biomechanics of a comprehensive scientific study with what I call "natural learning" techniques, to make improvement no harder than riding a bike or driving a car. If you apply the concepts you'll naturally be able to improve your swing and hit the ball further with the least amount of effort. Get the full story about BioSwing including all the latest information on how you can play the better golf. Gain instant access to this multi-media product that is delivered straight to your inbox. You can start improving your golf swing in the next 5 minutes. Get detailed instructions on Cameron’s favourite training drills for learning BioSwing. Includes the Amazing Drill and the full story on how to master the downswing move. Also comes with a detailed case study of Cameron’s golf swing and how he was able to own one of the lowest handicaps in the country. Best of all, he shows you with simple steps how you can fix your golf swing with the least amount of fuss. This action packed guide as all the key fundamentals on a single page. Remove all the confusion and focus on the steps that make the biggest difference. Print it out and use it as a handy reference guide. We’re not sure there is a more powerful (but simple) document ever made on the golf swing. This is the super-abbreviated version of the most detailed scientific study ever undertaken on the golf swing. Own this powerful information today and take your entire game to the next level. Q.What's BioSwing Secrets all about? A.It has been created for the golfer who wants more from BioSwing. Who is keen to embrace the magic of science and the incredible learning ability of the human system. If you’ve spent years in the golfing wilderness (like I did) and are ready to take your swing and game to the next level, then this product has been developed for you. 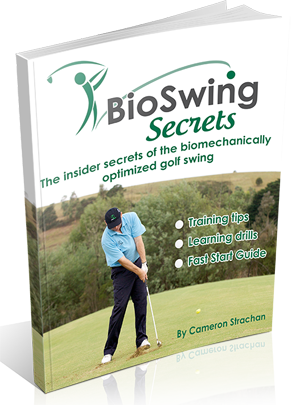 BioSwing Secrets comes with a PDF document and supporting videos. It goes way deeper than the original BioSwing video that you’ve most likely seen. Please note: Original video comes with this purchase. Q.What do the videos cover? A.They go into much more detail than the main video covers. In the original video we had to keep the time to under 20 minutes. In BioSwing Secrets, there was no time limit. So I cut lose, showing you all sorts of drills and training ideas not presented in the original BioSwing video. Also, there’s a section with me demonstrating BioSwing and how it works for me. I show you the flexibility of BioSwing by hitting a range of shots and some variation of the training drills. Many golfers relish these videos that showcase BioSwing in action and how powerful and simple this swing concept is. Q.How is this different from other swing models? A.BioSwing Secrets is more than just a swing model. It takes learning an improved golf swing to the next level. It’s a mix of science and natural learning principles. I help you learn a better swing without destroying your game in the process. I like to think this isn’t some fancy swing theory, but rather, a complete learning methodology that makes learning a better golf swing as simple as possible. If you’re frustrated because you know you should be playing at a higher standard, then BioSwing Secrets highlights how to break free and play your best golf. A.The Amazing Drill is perhaps the best training drill that I’ve come across. It shows you how simple the golf swing can become and will help you realise you have all the talent inside you. With the Amazing Drill you’ll learn the quirky secret that you don’t need to have a huge backswing to make a powerful golf swing. You’re going to have your hands on the information that has been described as “the golf swing of the future”. With the Amazing Drill you’ll learn the real secret to applying power and having incredible accuracy. Q.Do I get access to the original video? A.Yes, you get immediate online access to the original BioSwing video. It's simple! Follow the drills and you will improve your golf game. I'm not sure anyone has made golf swing improvement as simple as this! "I can only confirm that you're correct. A bad shoulder due to trying to kill whip that little birdie ball last year had me go from 11 hcp to 15.5. I played less this year, no competitions and applied the BioSwing principle and training tools. Wow! Pleasure is back, pain is gone and playing around 10. I am 64 and this is kids stuff. It is a fine tuned system and you are a Guru. Congratulations. (I think my Pro is not fond of you as we now say hello and good bye!)" "Cameron you are spot on. I am returning to golf after heart surgery and a frozen shoulder. I have been stretching and following your Bioswing advice. Yesterday I took my first full swings and the ball took off. My strength is down and my timing is not quite there but it was a fabulous feeling to strike the ball in the middle of the club and watch the ball fly just as I intended. Your methodology far exceeds any that I have witnessed in 41 years of teaching/coaching golf. Congratulations and continue your excellent work." "Hi Cameron, I would just like to inform you of my dramatic change in my game - basically overnight - and need to share my story with you. As an 11 handicap I was wondering why my friend was booming his drives past me by 30 yards. So after careful thought I realised that it's speed that counts and not power - so the faster I can swing the club the further the ball will go, right? So with my theory I looked up how fast the pro golfers are swinging. Wow up to 125mph. I thought to myself that I could probably swing the club faster by just swinging my arms...but everybody, absolutely everybody, says that's wrong. My next round with my new arm swing only I was 4 over for 18. And unbelievably, for 9 holes I was one under the card, something I'd never done before. To be honest, I panicked a bit because this was new ground to me but happy to finish only 4 over. My next round I was 8 over. Still very happy but once again I got nervous and threw in 3 double bogeys midway. My last round was 8 over again, this time I played the wrong ball up the last - so should have been 6 over! Anyway, your golf swing ideas work! Everyone else is teaching golf the wrong way around - big muscle theory is too hard and doesn't work that well. After 12 years of golfing I've feel I've finally got it. You are dead right and thanks for all your info. My handicap is now down to 8!"